Fiat Blog! 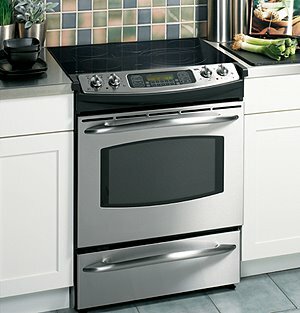 : Does your oven have a Sabbath mode? ..."Although the Sabbath and holiday laws, especially as they relate to the cooking and heating of foods, are rather complex, the engineers at GE are to be congratulated on their ability to have appreciated and comprehended the intricacies of Halacha (Jewish law) as they developed a Sabbath mode that will enhance the Sabbath and holidays of observant Jewish families," noted Dr. Avrom Pollak, president of the Star-K Kosher Certification. "This new feature is truly kosher consumer friendly and we at the Star-K are confident that the observant Jewish community is going to show significant interest in GE cooking appliances," he continued. Most modern ranges are equipped with an integrated twelve-hour shut-off safety device. This feature shuts down the oven's power after the oven has been operating consecutively for twelve hours. The GE cooking products with Sabbath Mode will override the twelve-hour shut-off. The oven will not shut off automatically making it possible to keep cooked foods warm on the Sabbath or use the range over religious holidays for cooking and warming food. A more truthful name would be "stealth mode," wouldn't it? Okay, now explain this to me: How is changing cooking temperatures but avoiding the appearance of changing cooking temperatures keeping the Sabbath holy? Anybody? ...Nobody can explain this to me? What you're doing is lying about whether you are cooking on the Sabbath or not. Why is lying okay on the Sabbath but cooking is not? Anybody? Help me out. I'm at a loss here. One view holds that these laws do have a reason, but it is not understood because the ultimate explanation for mitzvot is beyond the human intellect. A third view holds that these laws have no meaning other than to instill obedience. Probably the second sentence of the next section of the Wikipedia article is the key: "Indeed, the Hebrew word for 'holiness' is etymologically related to the Hebrew word for 'distinction' or 'separation.'" Wait a minute. Holiness is equated with separation? As it turns out, all of the irrationality of the mitzvot is acceptable because it creates a separate-and-thus-better status for those who follow it. An irrational basis for superior social status? Is that a good idea? I mean, in 2006? In a sense, I can understand the hatred of the Arabs for the Jews. I don't understand the degree of the hatred, but I can understand its origin--a nation which shares ethnic origins with the Palestinians and Syrians (genetic links have been found on the Y chromosome) assuming an inherent superiority for thousands of years without any factual basis, more or less playing the part of Mrs. Oleson in Little House on the Prairie. That would get a little old after a couple of centuries. Of course I could balance this argument with a discussion of the equal irrationality of Islamic law, but that would probably result in the torching of Google headquarters, the parent company of Blogger, which hosts this blog. Why should I care? What business is it of mine if six million Jewish Americans may want to own an oven with a Sabbath mode? 9/11 comes to mind. The continuing insurgency in Iraq comes to mind. Whenever an insurgent shoots at an American soldier, he's actually trying to shoot at Israel. My neice's husband safely returned from a tour of duty in Iraq. Why should it matter to me that my neice's three kids, at least for the time being, won't have to grow up without a dad? "My oven is the cause of 9/11 and the war in Iraq?? You're a shvents, shmendrik, shmegege, schmuck! !," Linda Richman might sputter on Saturday Night Live. No, of course the oven isn't to blame. The clinging to the irrational belief system is to blame. The refusal to let go of the elevated status the irrational belief system provides is to blame. The willingness to lie to maintain the appearance of following the irrational belief system is to blame. Self-centeredness, on an international scale, is to blame. The same can be said of Muslims. And Catholics. And Protestants. Clinging to any belief system that on occasion requires an explanation like "My ways are higher than your ways" is stupid. In the centuries before giant military transport ships and satellite communications and Stealth bombers, friction between conflicting irrational belief systems occurred less often and the collateral damage was much more confined. Now that Earth is wired like one large city, being stupid has a much greater impact. I let go of mine. Let go of yours. "thou shall not beep" was one of the 11th-15th commandments that Mel Brooks lost in that movie. But wouldn't it be easier to just buy a plain-jane, low-tech gas stove without an electronic console? I'm sure they still make them. But hey, what do I know, I'm goyyim. Well I'm sure if the muslims demanded a HALAL compliant oven or something thereof, manufacturers would eventually comply if there were enough buyers to make it worthwhile. As for religion in general, leave me out of it. Man has always gone to war over greed, religion has been the convenient excuse for it though. Afghanistan has oil pipelines, Iraq has oil. There's a reason why we never bothered with liberia or haiti. There's no oil, gold, diamonds, or titanium ores. "This capability can be utilized, if desired, but otherwise it stays inactive and unnoticeable to the non-Jewish consumer." However, the non-Jewish consumer is forced to pay for the Sabbath feature that stays inactive. It should be an optional feature the Jewish consumer pays for. Absolutely the most ignorant feature ever put into an appliance.. ever. If God destroys you because you decide to work (cook) on the Sabbath, then just unplug the damn thing and go hungry. I think that the Creator has more important things to worry about in the universe than if your fricking stove is on or off on a particular given day. It makes no difference to your life just as it did not before you read this blog! G-d created you and He recreates YOU and everything every single SECOND!!! if G-d wanted you to do something like not turn on or off your electicity on a particular day, just do that! Again... He created you... And the only reason you understand anything that you do understand is because He gave you that ability. So obviously if G-d told you to do something and you don't understand- it's cuz G-d didn't want you to! It would serve you best to listen cuz the only one you're fooling is yourself. G-d made you have these insolent thoughts... So think how foolish you seem when you think you're smarter than your creator...! Bring the Messiah with one act of goodness and kindness!